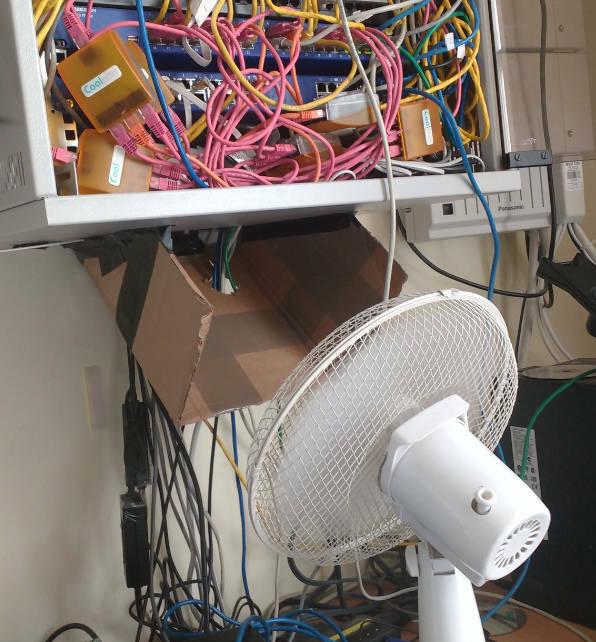 Never let it be said that techies aren't agile or innovative – and perhaps a little slapdash – when solving problems on a tight budget. Only this week, El Reg was given early sight of a pre-patented swanky new cooling system. 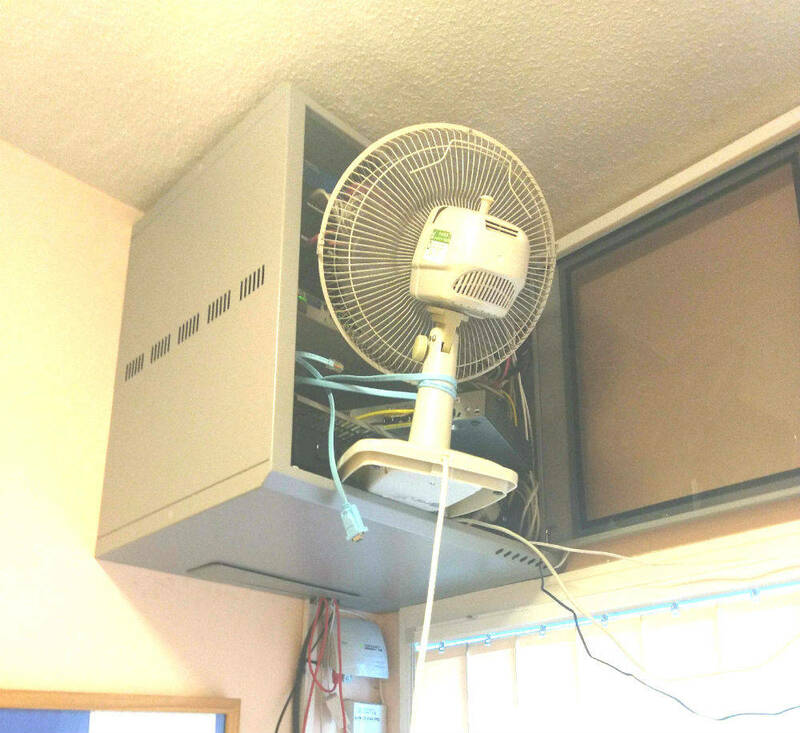 IT departments at businesses that asked to remain anonymous, for obvious reasons, have devised a novel way to counter the heatwave gripping Britain and prevent their cabinets from melting at minimal cost. Andrew Calver-Jones, director at supplier CTi Communications, a company that supplies tech, computers and networking gear, told us it had received messages from concerned IT ops folk at its SME customers that didn't have high precision air-con unit and were worried about their tech overheating. The advice? "We suggested pointing fans at the kit," he told us. "Some had more success with air con than others." He said customers then sent him pics of their installations. The results are below in "photographic form". "The Bristol Air Scoop" (Click to enlarge)... Pic: "Angus"
Behold, The Bristol Air Scoop (patent pending): as well as an ingeniously placed desk fan, this design – helpfully submitted by a hardworking techie who shall be named only as "Angus" – also includes an air funnel that ensured those hard-to-reach corners didn't roast. And it worked. The supplier happened to send the photo to another client worried about the temperatures outside and inside. Inspired by this and being of plucky stock, they adapted the solution to their own needs. The result is below. "My bet is that health and safety types might have a wobbly, even though I did securely lash it up with a spare cable!" the second IT support chap said. 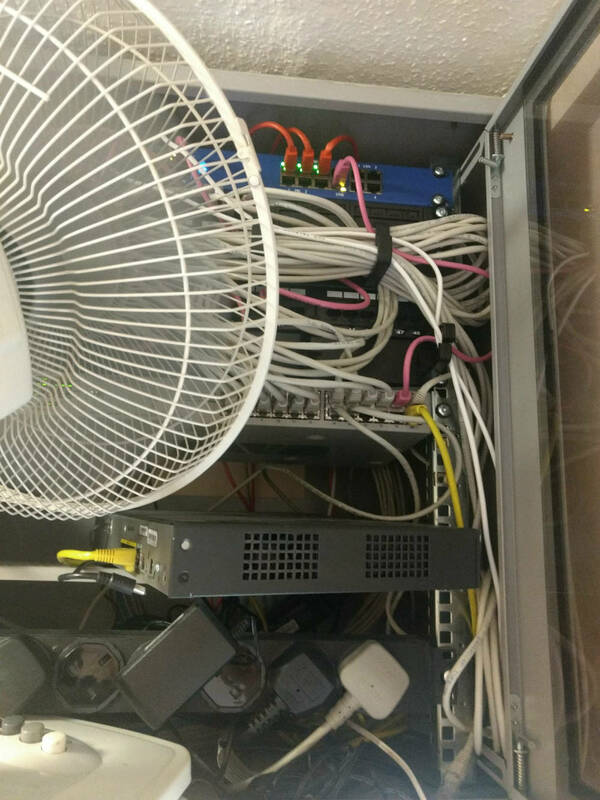 "We will probably buy a 1U fan to put in the base of the comms cupboard. I also powered off an unused Cisco router to further reduce temperature. Now there’s just an HPE unit in the box, along with the BT device." Makes you proud to be British!